Delhi Gate of Palace [Delhi}. bl.uk > Online Gallery Home	> Online exhibitions	> Asia, Pacific and Africa Collections	> Delhi Gate of Palace [Delhi}. 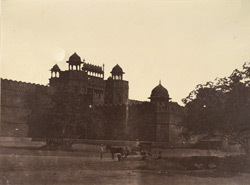 Photograph of Delhi Gate from 'Murray Collection: Views in Delhi, Cawnpore, Allahabad and Benares' taken by Dr. John Murray in 1858 after the Uprising of 1857. The Delhi Gate, the southern gate to the Red Fort or Lal Qila, was constructed by Mughal Emperor Shah Jahan (r. 1627-1658) for his new city Shahjahanabad. The Delhi gate was another entrance to the fort and is composed of lofty towers. The octogonal shaped fort complex is surrounded by high fortification walls of red sandstone which reach between 18-33 m in height. Key palace buildings inside the fort include the Diwan-i-Am (Hall of Public Audience), the Diwan-i-Khas (Hall of Private Audience), Moti Masjid, and the Khas Mahal (private chambers of the emperor).